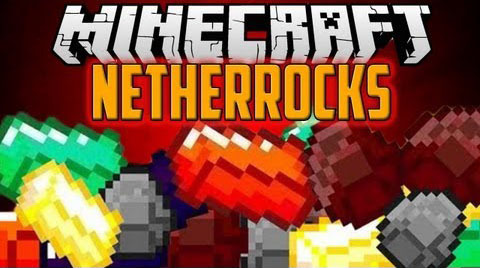 Netherrocks Mod is a fairly small mod that adds 6 new ores including fyrite, malachite, ashstone, illumenite, dragonstone and argonite, each of which have different strengths and weaknesses that you can take advantages of. There are both MinecraftForge and ModLoader/ModLoaderMp versions, for both clients and servers. Please note that Netherrocks and SimpleOres will only be compatible together if you use the MinecraftForge versions. Download and install SimpleOres Mod. All the ID’s used by Netherrocks, including Block ID’s, Item ID’s, Achievement ID’s and the spawn rates and vein sizes of these ores. Follow the instructions in the spoiler below to change these ID’s, remember that if you have a save game with items and blocks, changing the ID’s of those items/blocks will cause them to disappear. Run Minecraft at least once with Netherrocks installed, then close it. Navigate to your .minecraft folder and open the config folder, and then the Netherrocks folder (“%appdata%.minecraftconfigNetherrocks”). Search for the category of the ID you want to change. For example, ore blocks are under “ore blocks”, pickaxes are under “pickaxes”, and spawn rates are under “spawn rates”. It’s all fairly straight forward. Find the thing you want to change the ID of, for example Copper-Block, and change the number at the end of it. Block ID’s cannot be greater than 4096, while item ID’s should not be greater than about 28000. Save the file, and open Minecraft again. If all goes well, you should be able to play like normal.